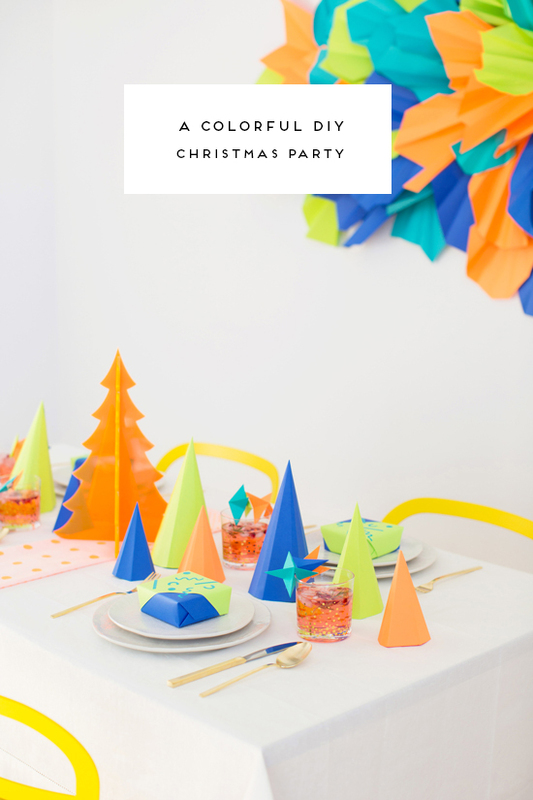 Next to decorating at home and in the studio, throwing little parties and entertaining has surprisingly turned into one of my favorite things to do. 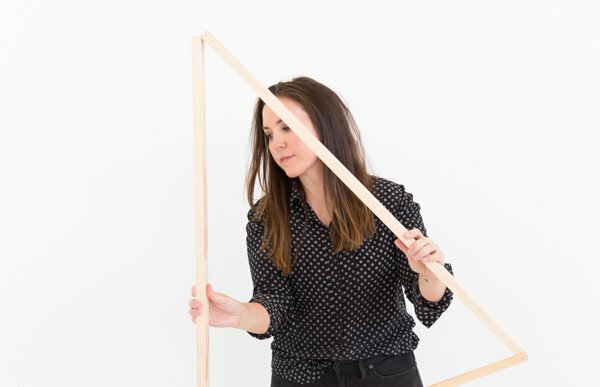 I love coming up with party themes, searching for cool tablewares, and brainstorming DIY party ideas (photo booth backdrops and DIY centerpieces anyone?!). 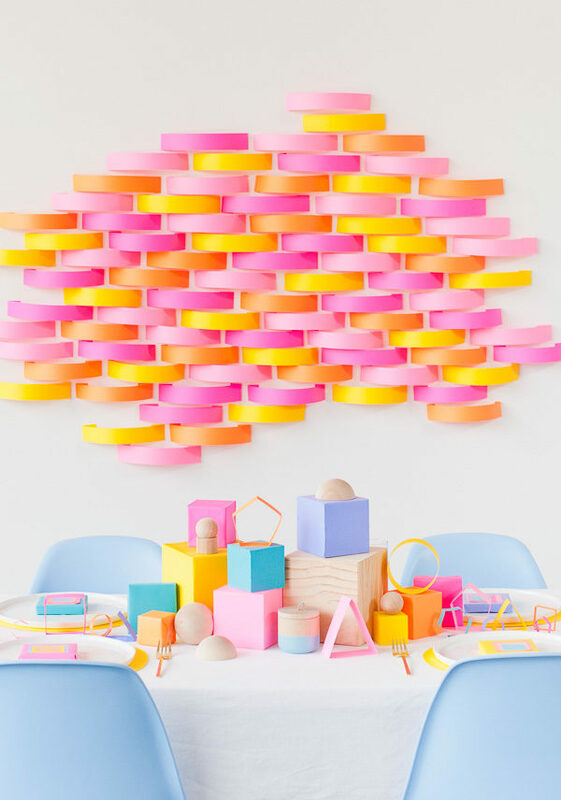 So, I’m thrilled to be partnering up with ASTROBRIGHTS® Papers this year as a Bright Life Ambassador to share some fun and colorful party ideas that you can create using their signature bright and bold color palette. I’ve been working with Astrobrights for years (see my dayglo Christmas party and the very neon Thanksgiving get-together for more ways to colorize your party). And when I need vibrant, saturated colors, it is truly the only paper I use. Bonus: It comes in multiple weights, which is great for getting an exact match when you need different paper thicknesses for projects. To kick things off with this first party post in the series, I’ve challenged myself to use a single material for (pretty much) the entire party. 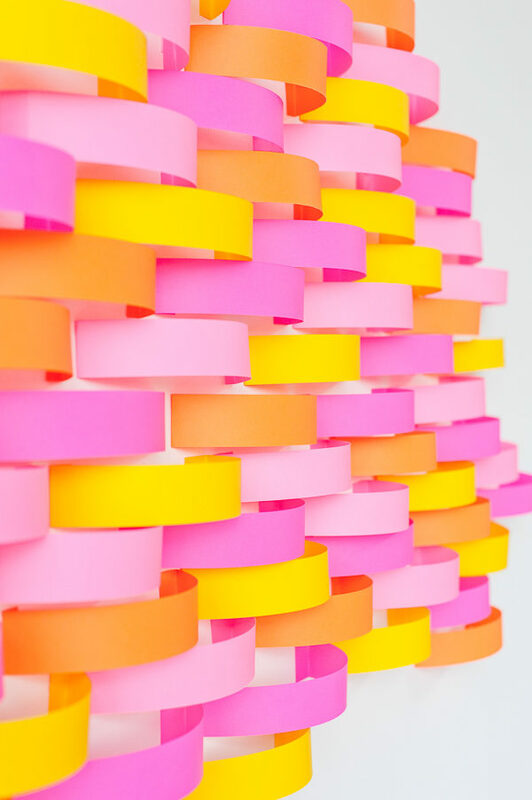 All of the DIY ideas are made of paper, which means they’re not only accessible and easy to recreate, they’re also super budget-friendly too. 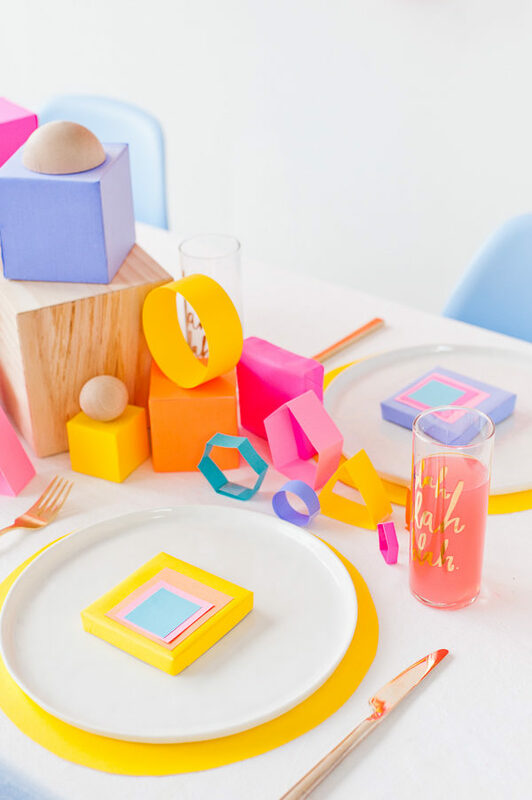 Click through to see all the DIY details (and tutorials) for this colorful party post. One of my favorite things to create for parties lately is a photo booth backdrop. When making backdrops I only have 2 rules: 1) It has to be quick and easy. I made a fabric photo booth backdrop years ago for an event and spent DAYS on it. Never again! 2) I always like to make sure it fits within the theme / color scheme of the rest of party, so it can double as an art piece / focal point. This particular backdrop took less than 30 minutes to create from start to finish and you don’t need any fancy supplies or material either. Just scissors, paper, and tape. I used Astrobrights papers in the following colors: Pulsar Pink, Fireball Fuchsia, Cosmic Orange, and Sunburst Yellow. 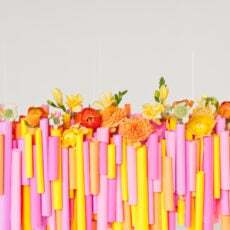 To make the backdrop, I cut strips of paper that are 2 inches wide and 10 inches long. Make a small fold at each end and tape the folded pieces to the wall, so the folds are inside the loop. Continue this process in an all over pattern, staggering the placement of colors and positioning until you’ve reached the desired size. Instead of flowers or plant centerpieces, I went with a geometric centerpiece made of wrapped wood blocks. 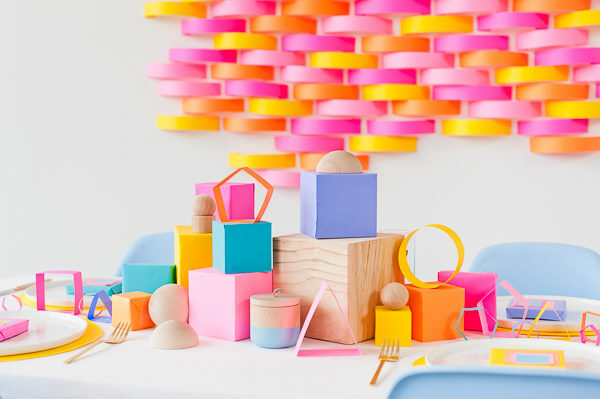 For a birthday party, another option would be wrap the birthday girl’s (or boy’s) gifts with paper and stack them in the center of the table, for a similar look. I added a few unwrapped wood blocks in geometric shapes to round things out and bring in another element. 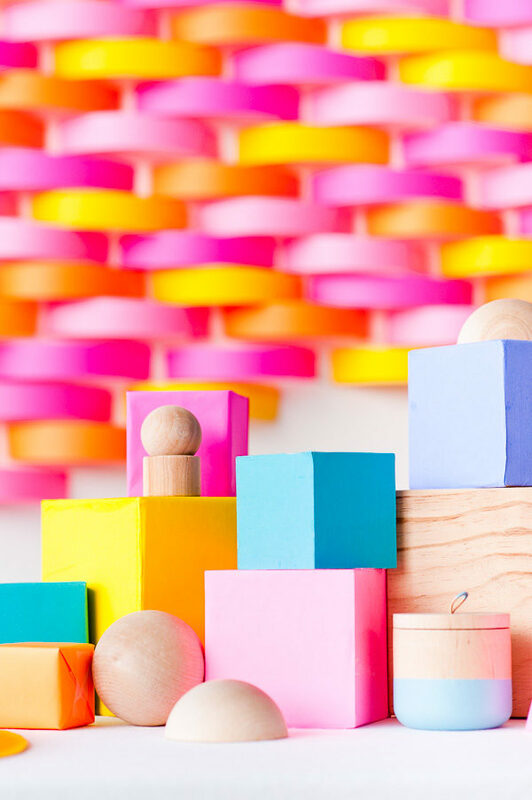 The geometric blocks were wrapped in the same colors as the photo booth backdrop, plus Venus Violet and Terrestrial Teal. 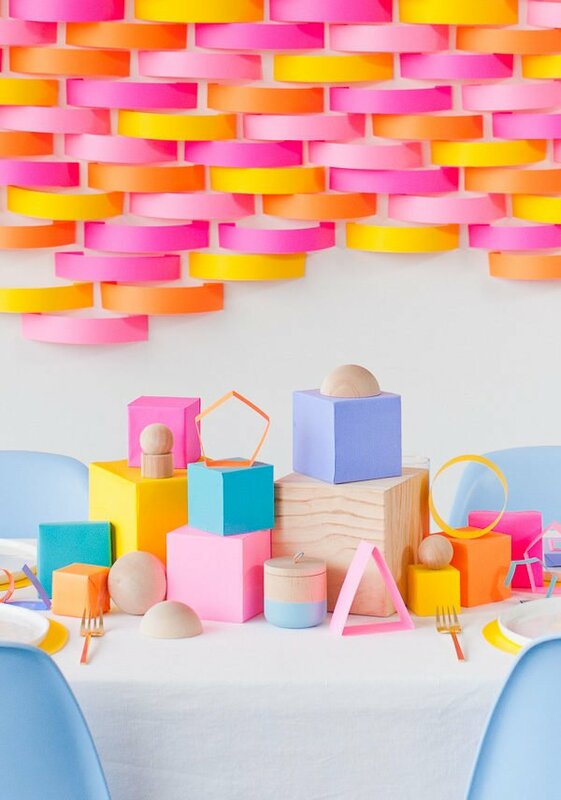 To add a little something extra to the centerpiece, I made some three-dimensional shapes using 1 inch wide strips of Astrobrights paper, then folded and taped them into various shapes. It was super easy. To get some separation between the white plates and white tablecloth, I made some simple paper chargers by tracing a bowl that was a few inches larger than the plates and then cutting each circle out and placing it under each plate. And last but not least, I made some Josef Albers inspired party favors for each guest to take home, that sat at each place setting. They were just small boxes of chocolate that I wrapped in paper and then cut out smaller squares in various colors and glued them on top. Again, super easy and fast to make too (which I love). Find more inspiration and ideas to Colorize your life on the Astrobrights Facebook page. 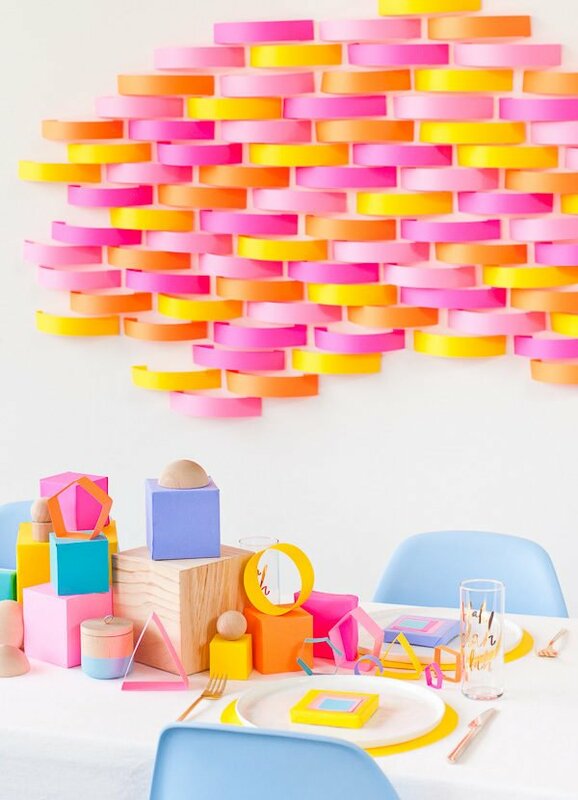 What kinds of projects do you like to make with paper? 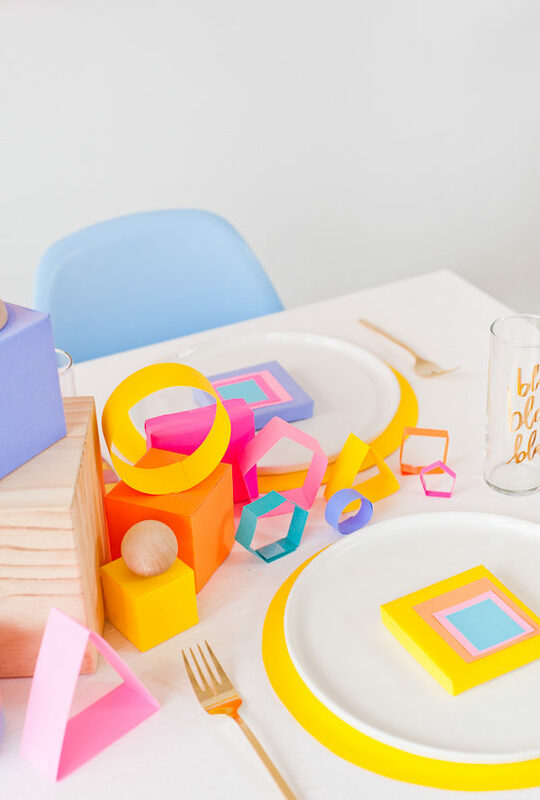 And which DIY from this party post is your fave, if you could only pick one? I’d love to hear your thoughts. This post is in partnership with Astrobrights. A company that I have used (and loved) for years. Thanks for supporting the brands that help keep Paper & Stitch running. next post >DIY Three Way: A Shibori Textile Project for Your Walls, Your Kitchen, and Father’s Day?! The colors in this project are so fun! I love the way you mixed warm and cool colors. Back in the day, I used to love to do origami. You’re making me want to pull out an old book and have fun with bright colors. 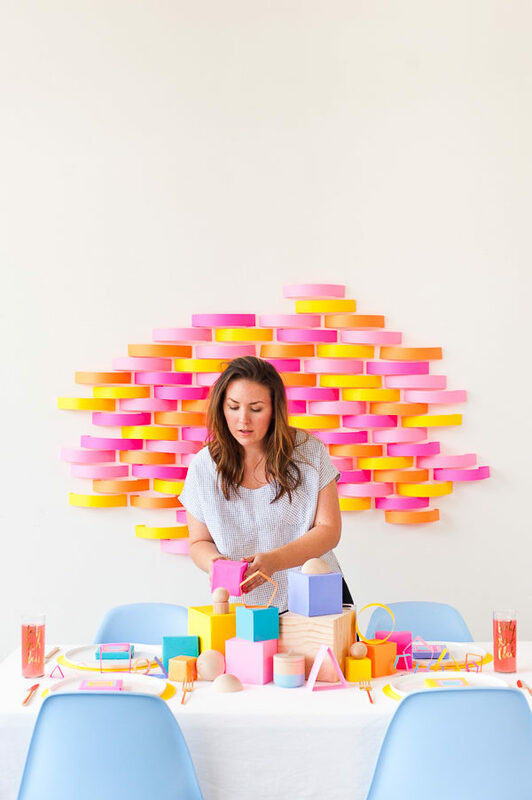 Oh…and you know the photo backdrop is my favorite project from this post. I can’t believe it only took 30 minutes! Glad you like it Kimberly. Yep, the photo booth backdrop took no time at all….I was (pleasantly) surprised by how fast it was to put it up too. Oh my goodness you are so creative!! The color combinations are the best! That backdrop is totally gorgeous! Brilliant idea! I love this! So simple and clever and colorful and geometric. And I love ASTROBRIGHTS Papers too! It’s my go-to paper for all my paper crafts. Awesome Kathy. So glad to hear you’re an Astrobrights fan. Brittini – this is absolutely amazing!!! The basket weave wall decor is fab! Bravo! Thanks so much Sara. Really happy to hear that you like it. waaauw, I am totally in love with the photobooth background and am nicely surprised it only takes a short time! definitely something to try out!! Thank you for sharing!!! Hi Barbara. 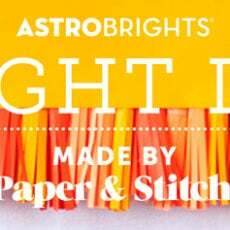 Astrobrights is a colorful line of papers that is available at retail stores across the country. You can find more info on where Astrobrights paper can be purchased here: http://www.neenahproducts.com/astrobrights Hope that helps!